So fellow travelers, looks like Old Man Winter may put in an appearance over the next few days. Winter storm alerts are popping up on local media. 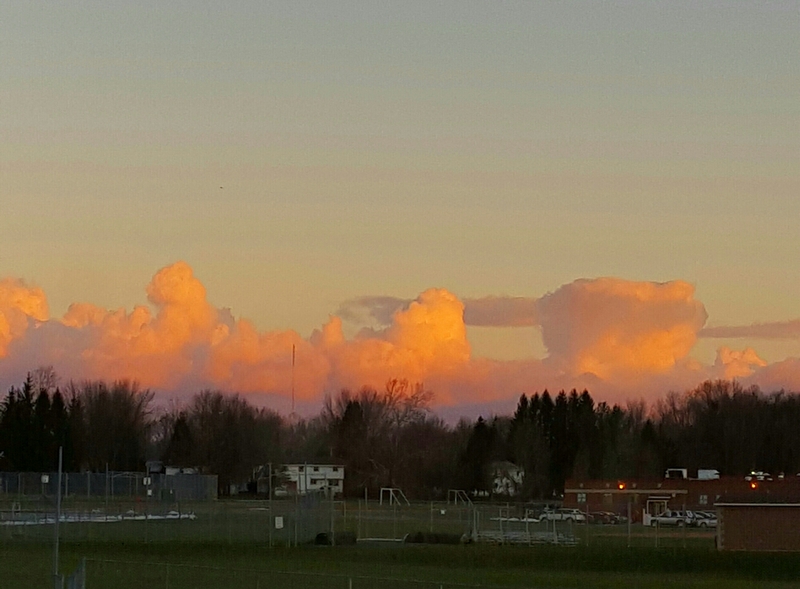 Right on cue, banks of Lake Effect clouds are building over Lake Ontario. Sunrise cast a glorious light on the massive blocks of grey. A different ending came to mind at first. It read Dig in get ready. Yet that line did not fit the feeling I got from the image I had captured on my phone camera. I realized it came from the mind set of the storm alerts. So I immersed myself in the image of brilliant clouds and found the ending I used in the final edit. Life lessons from a simple creative exercise. Tapping into the energy of fear changes the results of our creative output. Shifting focus from darkness to Light changes everything. True, creativity is not always neat or pretty. Being a mirror of life, it can be dark, raw and in-your-face. I can accept that kind of creativity because I have the freedom to choose whether or not to participate and whether that participation is as an observer or as part of the creative process. Dark, raw leadership is another matter. It may have its place in some systems, but I could not accept it as the primary voice guiding a group with a stated purpose of creative growth and encouragement. There are too many angry voices trying to claim power in this world. I choose not to follow them. Now I have migrated to a new creative group, with a team of administrators who share the responsibilities of leadership. It is a style of leadership I feel comfortable with; their diversity of experience and personalities will bring balance and depth to the group as it grows. I have no doubt our voices will be heard.